Yin And Yang And Aromatherapy Essential Oils For Healing. How Does Yin and Yang Work With Aromatherapy? Yin and Yang describe complementary and opposite energies which are present everywhere - in everybody and everything. The principles of Chinese medicine are primarily based on this concept of two distinct forces. Yin is seen as feminine, dark, moist, cool, soft and receptive. It is associated with the earth and moon, autumn and winter, and the night. Yang is seen as masculine, light, dry, hot, hard and active. It is associated with the sun, spring and summer, and the day. Nothing is completely Yin or completely Yang and the balance of Yin and Yang is constantly changing. Energy (or chi) flows through the body in channels called meridians. There are 14 main meridians each related to and affecting a major organ of the body. Yin meridians are on the front of the body with energy flowing upwards.....Yang meridians are on the back of the body with the energy flowing downwards. A balance of both of these energies is very important to the well-being of an individual. If one or the other is in excess then there may be physical and mental problems. This is where aromatherapy can be beneficial.....it can work very well together with the Yin and Yang theory. Essential oils can be classified as yin or yang, according to their frequency (wavelength) and their notes, or the rate of evaporation. For example rose and geranium can be classified as Yin and will support Yin energy whereas juniper would be seen to be Yang, supporting Yang energy. 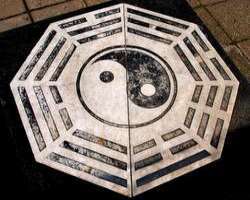 It is actually quite difficult to fit essential oils categorically into Yin or Yang as many fall between these extremes. In fact, the nearer they are to the middle, the more balancing they will be - for example lavender. It does mean that a therapist can select oils, using these principles, for calming, balancing or stimulating. By returning the energy or chi of the body to a state where Yin and Yang qualities are in balance means that health is restored. So...Which Essential Oils Have A Yin Quality? Some oils will promote Yin in your body and some will counteract excess Yin.........so which do you choose for which? Yin oils have a higher frequency and tend to be the top notes. They include rose, chamomile, eucalyptus, geranium, cyprus and ylang-ylang. Strongly Yang oils can be helpful for balancing excess Yin states. ....and which Have A Yang Quality? Essential oils which promote Yang in the body, are warm and invigorating oils such as ginger, cinnamon, rosemary and thyme. Patchouli, clary sage, black pepper, juniper and myrrh are other oils which will promote the masculine energy of Yang. You can use cooling, moistening essential oils to counteract excess Yang such as lavender, lemon, chamomile and melissa. How Can You Use The Essential Oils To Help Balance Your Energies? There are several ways you can help bring back the balance in your life! Put a few drops of your chosen oil or blended oils into your bath. use an oil burner with a few drops so that the aroma permeates your living area. Blend your choice of essential oils with a carrier oil and use in an aromatherapy massage. Put a drop or two of oils on a hanky or tissue - easy to keep with you night or day. As you can see, aromatherapy and the Yin-Yang theory can work wonderfully well together! Keep your energies balanced and stay healthy!